The pre-release conversation around The Elder Scrolls Online was all about that subscription – a monthly tithe of the kind so many other prominent developers had roundly condemned. But launch came and went, and it seemed there were more than enough Elder Scrolls Online subscribers. Now, Zenimax Online intend to sustain momentum not only with September’s Update 4, but with a series of conspicuous rewards for subscribers to flaunt all round Tamriel. 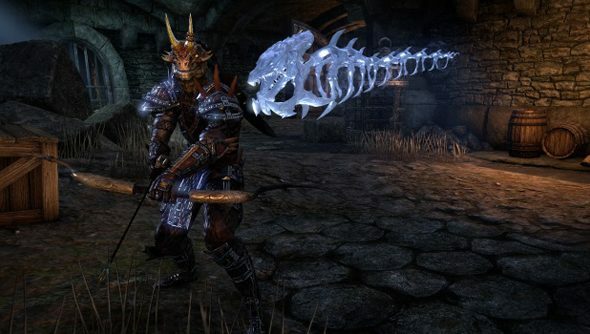 The first reward is a High Hrothgar Wraith vanity pet, modelled by the argonian above. That’ll be gifted next month to every player who’s been subscribed for three months beyond their initial 30 free days. It’s not a time-limited offer: new subscribers and those who’ve let their subscriptions lapse will find themselves wraith-laden as soon as they cross the three-month marker. Zenimax plan to expand their range of loyalty rewards over time. There’ll be another gift granted to six-month subscribers. “Stick with us, and you’ll have quite the collection to show off before long,” say the dev team. Are any of you lot Elder Scrolls subscribers? Or if not, are pets and regular updates enough to make one of you?